So I am sitting in an extremely comfortable hotel room in Урай (Uray), which was our target for today. They have a bed, heating, a shower etc etc, I just ate cheese and bread and drank beer with cool people and I am very very happy to be here. The last few days have been a lot of fun, and particularly yesterday in the “funny in retrospect” sense… Our first day (three days ago) our target was a town called Tavda, which we made no problems all. Started at about 1pm after the rally launch, picking up some fuel, final formalities and a slow recovery from the night before (traditional Russian dinner with “moonshine with spices”, and singing Babushkas, followed by a banyan experience – a Russian sauna followed by a quick dip in an icy lake. videos were taken, and I sincerely hope none ever see the light of day). 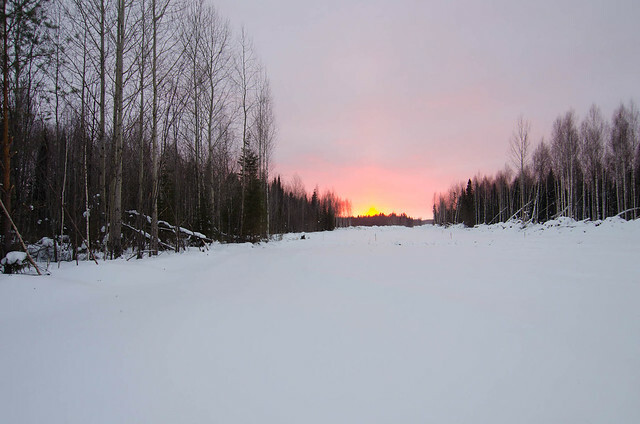 We made it to a lovely campsite across from a frozen lake about 5pm, found firewood and had a great time, singing country music around the fire, cutting down trees and whatever other manly things you normally do while camping. Day two we enthusiastically set off and utilising my rather excellent navigational skills our convoy of four bikes headed north-east. Two hours later, we found the road petering out and after asking locals it turns out we should have headed north from our campsite, whoopsie. So 200km back the other way… We were all feeling a bit down. And then the sun came out to illuminate the snow-covered pines by the road, LCD Soundsystem was closely followed by The Whitlams on my iPod and I realized that we were in freaking Siberia, entirely of our own volition and with everything we needed strapped to the back of a vintage Ural. And if that isn’t enough to make you very very happy nothing will. Lost, but the shop sold tasty tasty food. The countryside is bloody beautiful, by the way. We made about 40km of forward progress (240km less the 200km detour) and stopped to camp outside a small town. Clear night, cold, and we were interrupted by Russians from the town rocking up on various dilapidated forms of transport (turns out theres a fuel shortage, and we couldn’t get any of the fuel we desperately needed to get to the next town). 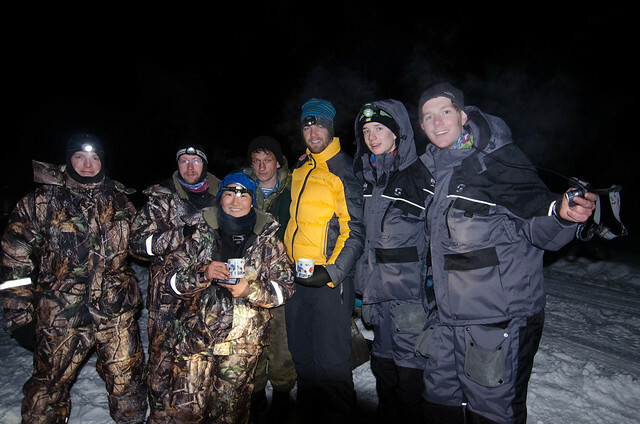 They brought vodka, snacks, firewood, home-cooked meals and sat around until about 2am drinking with us. The Russians we have met on this trip are without exception totally awesome people. The next morning was super duper cold and had to get going. We buy 20L of fuel from one of the other teams heading past (cheers!) which gets us as far as the next town but we till desperately need fuel. 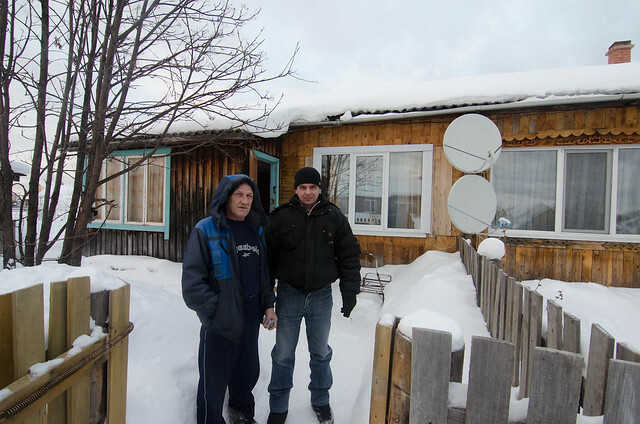 We pull into town, buy a few things, get invited into the local school for a hot lunch (russians are a amazing), Guy gets taken to the mayors office to ask for fuel but no dice. We press on. The rest of the day I covered in my audio blog from last night. It was really really tough going. Imagine 4×4 through soft sand (snow). I swear I pushed that bloody motorbike for the whole 40km down that road, around trucks that refused to move. It was the worst. 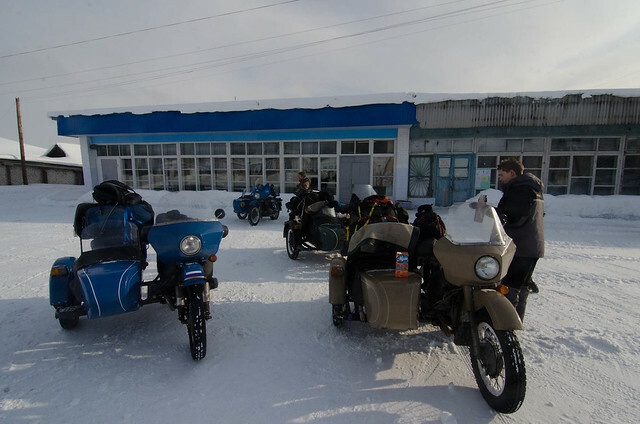 Finally finally we got to the end on to a blessed highway, and pull over to fix Geordie’s sidecar (we’ve been convoying with him and a couple of other teams). Some Russians pulled up in a Nissan ute and asked how the road was that we just came out of. I paused, looked at their car, and said “In this car, no problems!”. They drove off. I’m probably going to hell. made it into another town, our destination. Utilizing Bjorn’s excellent Russian skills we negotiate to purchase petrol off a couple of locals for twice the going rate. Fuel shortage there too. Fill up all the bikes, and while we’re waiting me and Geordie see a couple of guy walking from their shed to their house with an armload of firewood. With my best Russian I ask if we can buy some, and when he works out what I’m trying to say he just says help yourself. He had the biggest shed full of neatly chopped wood I have ever seen, and refused payment. Russians are awesome. These guys gave us dry firewood, and refused payment. Seriously, this was the best thing in the world after the day we had. If you’re reading this guys, thank you so so much. We pull up in a blessed cafe on the outskirts of town and a beer, then head to a campsite Bjorn scouted out about 2km down the road. It’s a beautiful spot, we have a roaring fire, and life is wonderful after a truly tough day. In the morning we get a really fantastic sunrise, after a few repairs to the bikes we press on. Stunning sunrise. Pictures do not do it justice. Make it on fantastic roads to s small town called Мортка (Mortka) where – wonder of wonders – they have a petrol station. With petrol! We fill up everything with beautiful beautiful 80-octane бензине. On top of that, three local bikers rocked up and helped out checking over the bikes and filling us up with oil. When Geordie complained (in gestures) that his bike was perpetually jumping out of second into neutral, and he has to hold it in to the detriment of his left foot, their response was (in gestures) “they all do that. You need to learn to change gears better”. Geordie spluttered. In any case they were awesome dudes and you should check out their website at http://www.motougra.ru . 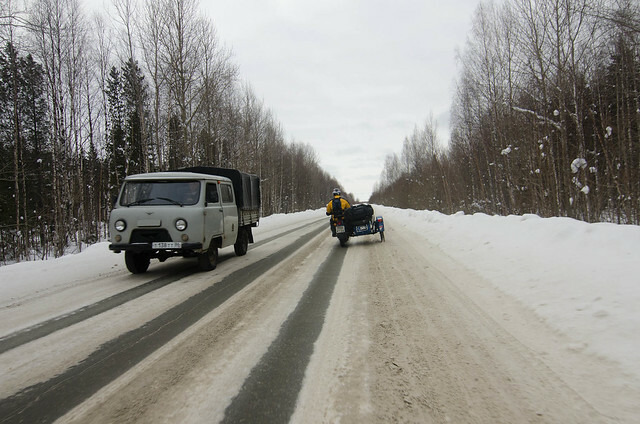 We pushed on for Urai on gloriously paved roads, cleared of snow and ice. Tested out the Panzer (our bike’s) top speed – 80km/hr on the flat with no wind, but we both got it up to around 100 downhill much to the terror of the person in the sidecar – and finally made it to this blessed city where they have a hotel. With showers, after camping in the cold for four days. Good roads! Oh my god it was so nice to be able to just _go_ and not stop every 5 minutes and climb in and out of the sidecar. You have no idea how good the above looked to me, I promise. When we arrived we pulled into a parking lot to work out what to do (it’s a largish city, 40,000 people) and a couple of police pulled up and asked for our documents. They seemed interested, asked about the trip (I was sincerely hoping they wouldn’t notice our illegal broken headlight) at which point we asked them if they could direct us to a hotel. They said sure, follow us in our car! Awesome. When we got there, some person walking past on the footpath stopped to translate (!) and they said we should leave our bikes at the police station so stuff wouldn’t get stolen. We unload our baggage as they generously wait, random lady from Moscow in the hotel foyer offers to translate (and tells us she would never travel in Russia – everyone is dishonest and we’ll get robbed! Not what we’ve experienced), head to the police station with translator in tow, at which point they say that the police commissioner would like to meet us. We rock up, unshaven and dirty to this very classy office and interrupt this dudes meeting so he can say Hi! He asks where we’re off to, wishes us good luck, and asks what time we would like a police car to direct us to the right road to our next town! We booked it for 1pm. Just wow. So yeah. Headed back to the hotel, got us some bread and cheese and beer from the local Продокти (Produkti aka corner store) had a shower and I am currently exceedingly happy. Plan for tomorrow to head North towards Nyagan which is the entrance to the ice road to Salekhard, though that’s a few days away. In the meantime enjoying the experience. A few photos are up at http://flickr.com/blinken, Guy has more on Facebook, we’re both safe and happy.